Segway City Tours of Amsterdam is not only fun, but also a very interesting way to explore Amsterdam. We offer different Segway sightseeing tours around Amsterdam here. Book your tickets for Segway City Tours of Amsterdam here! When driving through Amsterdam on your Segway, you will see how smiling and friendly the Dutch people are. On our 2 hours city Segway tours of Amsterdam, you will of course see all the highlights Amsterdam has to offer like; the Jordaan, the Museum square, the Dam square, The Waag, The Rijksmuseum and of course the famous Red Light district of Amsterdam. But we will also see and discover the less known places, squares and alleys of Amsterdam. You will of course have an skilled Segway guide with you on the whole tour, and you will be in constant contact with the guide through a wireless headset under your helmet. At the same time, the guide will give a lot of interesting and pleasant information during the tour. The group has a maximum of 8 participants, which ensures you that you will always be part of a personal and high quality tour! Our Segway City Tours of Amsterdam is the way to discover Amsterdam in your own way, without walking or bicycling, just by floating on your Segway! - The guide will be in English. - The tour duration is 2 hours incl. 20 min. of Segway training. - There is no food or drinks incl. in the price. - Please wear flat shoes. High heels, sandals, flip flops are not allowed. - When the weather is too bad ( freezing, to much rain, snow or just to cold) to drive, we always try to make another appointment or you get your money back. - Always dress accordingly to the weather and season. - Please bring a valid photo ID. - You must be at least 16 years old, but younger than 70 (ID required). - Disabled or pregnant cannot participate. - You must weigh at least 100 lb (45 kg) and less than 250 lb (113 kg)! 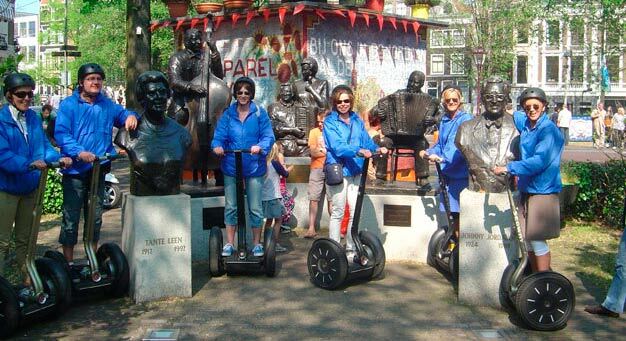 - Segway City Tours of Amsterdam starts and ends at Bilderdijkpark 12A in Amsterdam.